Scott Fratcher and Allison Thompson are lifelong cruising sailors, and your dedicated crew aboard your charter yacht Mariah. Scott has authored six books in the marine field, sailed over 200,000 sea miles and holds a Royal Yachting Association Yachtmaster Commercial Ocean certificate. Scott is also a certified Marine Engineer (MEC3) with many years aboard large yachts. Scott served with the record breaking Team Earthrace as Chief Engineer and at times as Captain. Allison has over 30 years sailing experience, sailed over 200,000 sea miles, served as Captain of the Feadship De Vrouwe Christina, holds a Yachtmaster Ocean Commercial and has held a United States Coast Guard 100 Ton license with sailing endorsement for over 15 years. Allison is also an International RYT yoga instructor and teaches locally and is taking continuing education to become a certified yoga therapist. Allison will be happy to help make yoga part of your vacation. Both Scott and Allison served on the 24meter, carbon fiber, biodiesel powered Earthrace in a "hands on" role for the 2007 round the world speedboat record attempt, and played key roles in the breaking of the round the world speedboat record in 2008. Why sail with any other crew when you can sail with part of the team that won "The Worlds Longest Race" and "The worlds most difficult boating record?" Click here to listen to the World Record holding skipper of Earthrace, Pete Bethune recommend Scott Fratcher as the "most brilliant engineer I know" on National Radio. 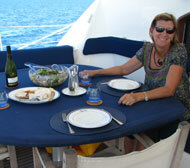 Scott and Allison will be happy to share their stories with you and make your charter holiday a memorable one. 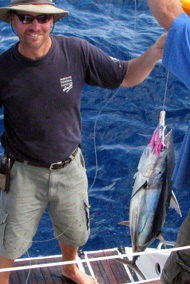 Scott Fratcher, Captain and Marine Engineer, shares your passion for the ocean, fishing and having a good time. for food, health and the Pacific.